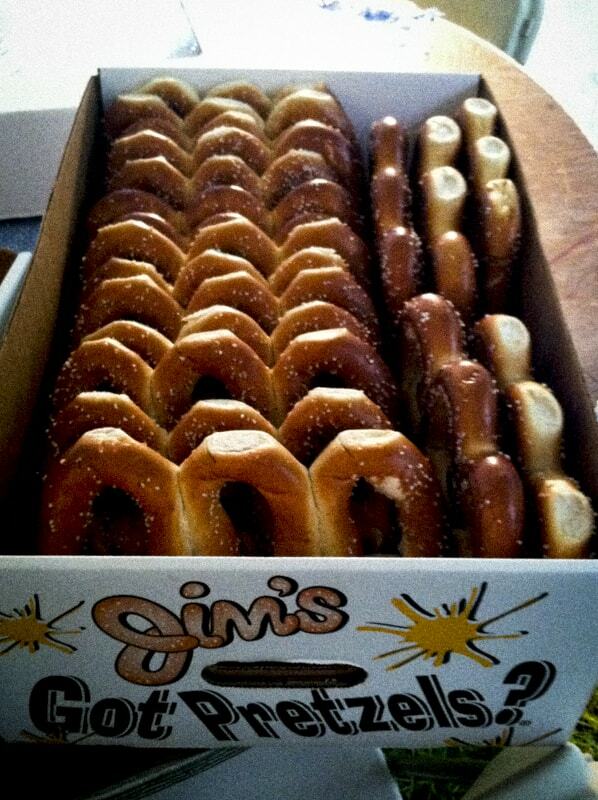 I have always been a soft pretzel lover. Having grown up in the Philadelphia area, I was lucky enough to get my hands on good hot soft pretzels all over the place, from vendors on the street to Phillies games. They were everywhere really. But, probably the most formative experiences in my journey of pretzel appreciation occurred in one place in particular: Reading Terminal Market. On weekends, my parents regularly took my sister and me on the one hour drive down to Market Street in Philly. On our visits, we’d wind our way through the hundreds of food stalls to the Pennsylvania Dutch pretzel vendor. We never missed it. We’d order up a batch and the bonnet-clad Misses would pass over the screamin’ hot pretzels in parchment, brushed with sweet melted butter. Then we’d walk through the market, butter soaking through the paper and dripping down our hands, knowing there was nothing better. I’d tear off bites, dipping each in good mustard. And before you knew it, I’d devour the whole thing. It was blissful. 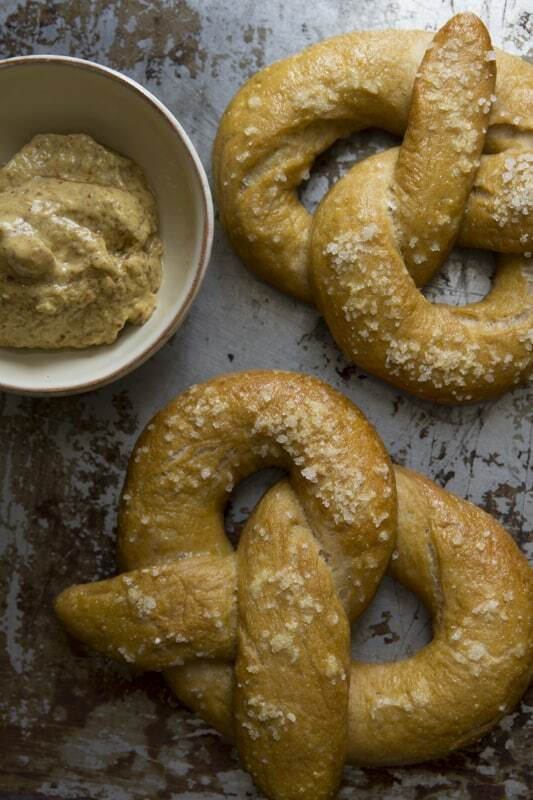 So knowing that, you may not find it hard to believe that the first recipe I ever developed was for soft pretzels. I asked my mom to dig up the recipe card I’d written so I could show you. 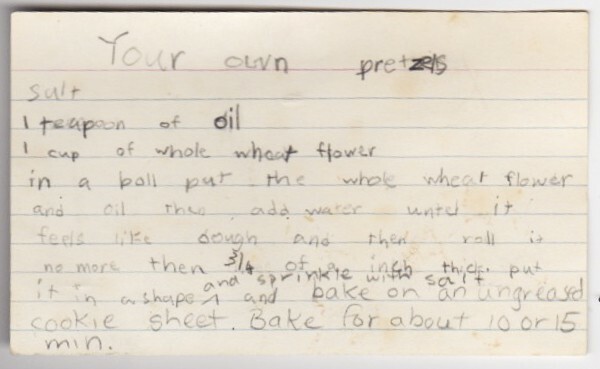 I’m not sure how old I was, but judging by the handwriting and inventive spelling, I wasn’t very old. And from the looks of the recipe, the resulting pretzels were probably was pretty dense. It was with all of this in mind that I recently decided to tackle soft pretzels again, this time with a more informed approach. 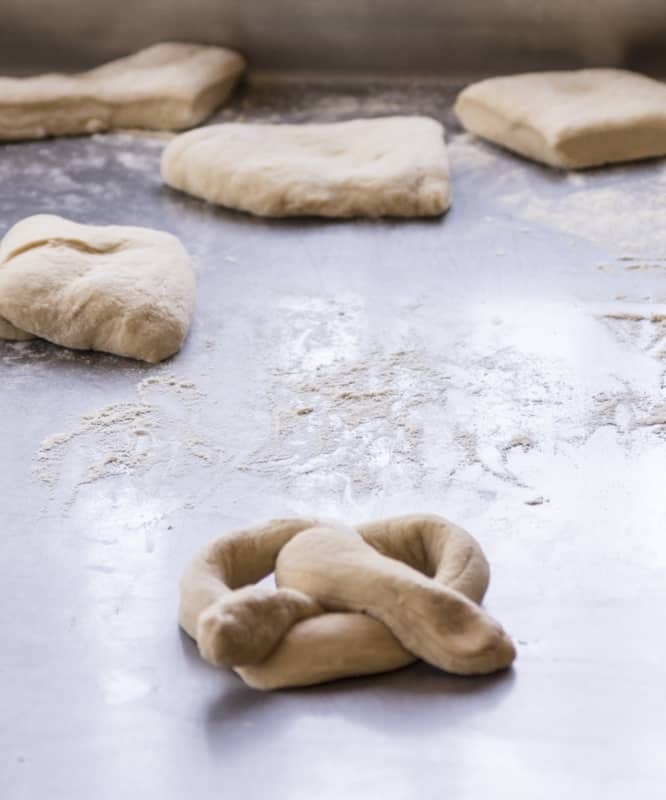 While at Blog and Bake, I asked a lot of pretzel related questions. 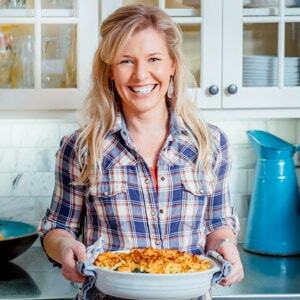 Particularly of Susan Reid, my former culinary school chef instructor, who is now the King Arthur Flour Test Kitchen Queen. She was giving us a presentation on all of the different flours and their uses. I asked her about a strategy of coming up with a whole-wheat pretzel recipe, and what type of flour to mix with my favorite white whole-wheat. She agreed that bread flour would be a good option to blend in, so that they would have enough gluten development for the right texture. Beyond flour, I knew there was more to making a pretzel better than my brick-like “Your Own Pretzels.” So, when the Blog and Bake instructors taught us how to make our pizza dough with a pre-ferment (aka a sponge or polish) I knew I’d like to fool around with that technique for the pretzels too. Then best of all, I also discovered that fellow Blog and Baker, Rebecca of Foodie With Family,has a real appreciation for soft pretzels too. Please take a look at her site. 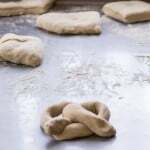 It is teaming with excellent pretzel recipes. Upon our discussions, she advised me to use malt for that classic pretzel taste. So I added that to my list of musts. So when I got home I saw that there was a whole-wheat pretzel recipe in the King Arthur Flour Whole-Grain Baking Cook Book. I went ahead and based this recipe on their technique. I added in the step of making the pre-ferment with the whole-grain flour. I did it slowly in the fridge, but you can also do it on the counter-top in a third of the time. Like resting the dough in the whole-wheat chive biscuits recipe, this pre-ferment step will soften the bran of the wheat. 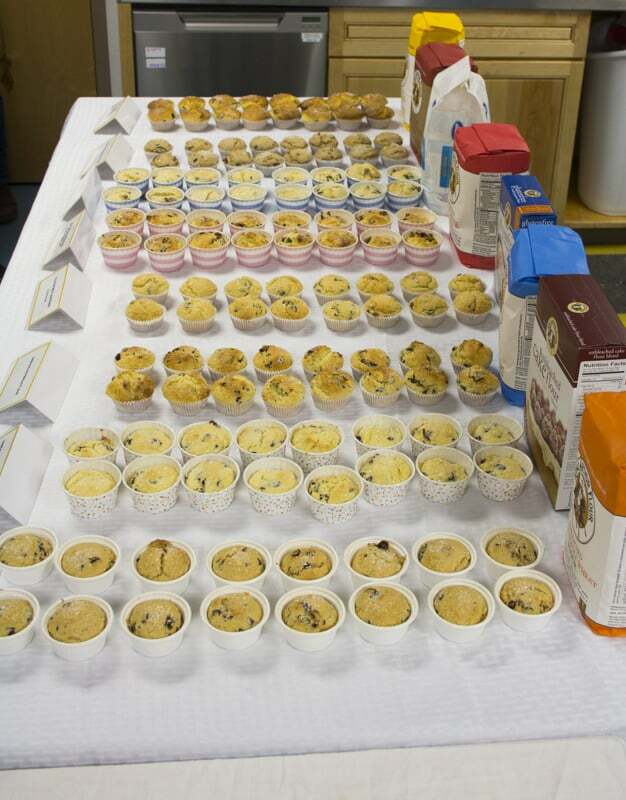 It will also allow the flour to absorb more water overall and develop a more complex flavor. 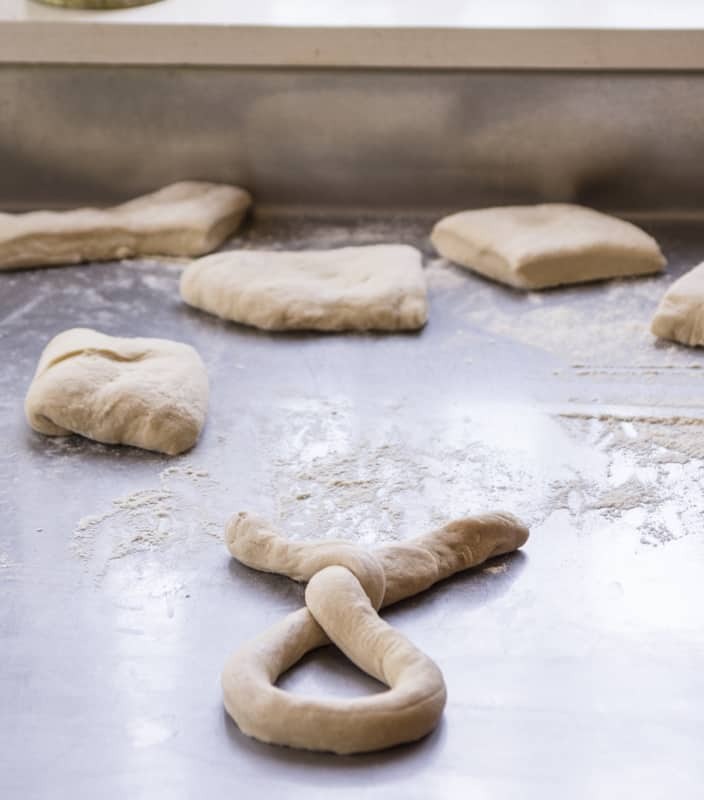 Once I got the dough ready, forming the pretzels is actually easier than you think might be. 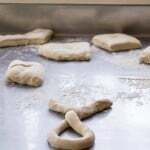 I cut the dough using the good old snake technique, see below. [You cut it into a long equally-wide piece. This allows you to more can easily judge how wide to cut the portions with a bench knife. Then I weighed out equal portions. Then I formed them like this before they went into the baking soda bath. One last pretzel related note. I was getting all excited to share this recipe with you last week, and tell you all of that, but I ran out of time. I was heading out of town for my high school reunion. [I went to George School. Which is pretty much the coolest high school ever. And I didn’t want to miss seeing my old friends.] When I got to the party on Saturday evening, I knew that the timing of this post was just right because my friend arrived to the party with two glorious boxes of fresher than fresh soft Philadelphia pretzels. I had two. 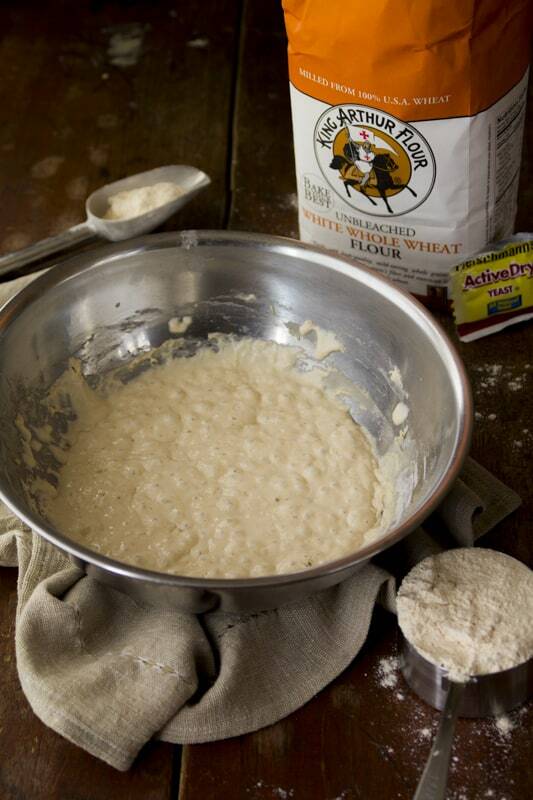 Make Preferment: Whisk white whole-wheat flour, water and pinch of yeast in a large bowl. Cover and let sit on the counter overnight, or refrigerate 20 hours. 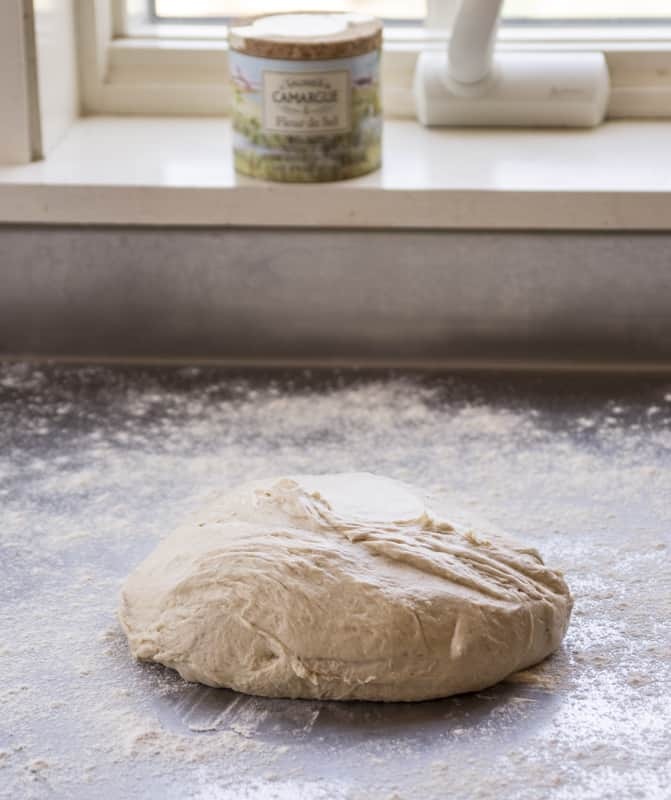 Make Dough: Stir bread flour, softened butter, salt, 1 teaspoon yeast, and barley syrup into the preferment until it is too difficult to work with a spoon, and then work with hands in the bowl until the dough comes together in a sticky mass. 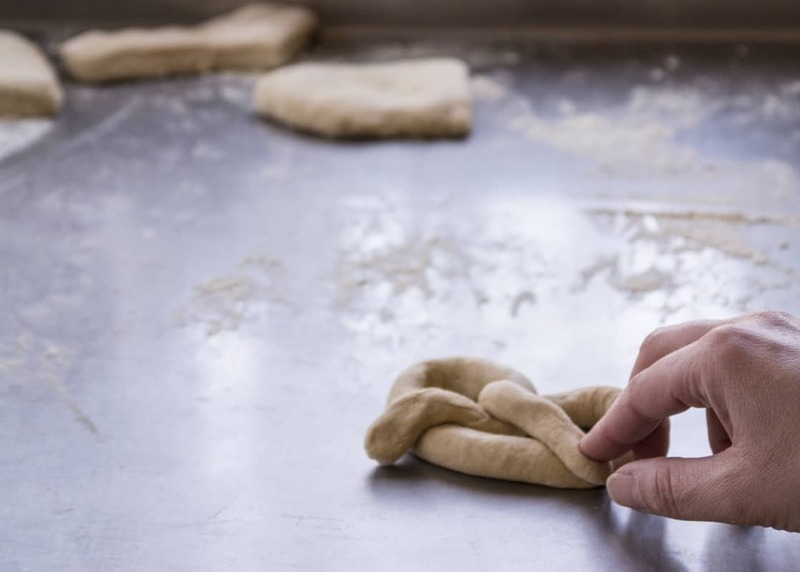 Turn out onto a lightly floured surface and knead until the ball of dough is smooth and elastic. (Do not mix in extra flour. 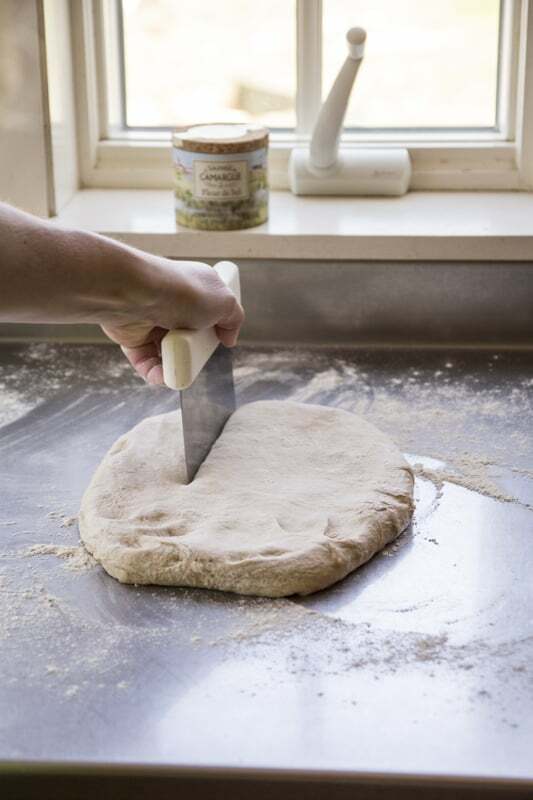 The dough will seem a little tacky at first, but will improve in texture as you work it.) Transfer to a clean bowl, cover with plastic and set aside in a warm place to rise until doubled in size, 1 to 2 hours. Prepare Water Bath: Bring water and baking soda to a boil in a large flame-proof roasting pan, or large wide pot. Coat a large baking sheet with cooking spray. 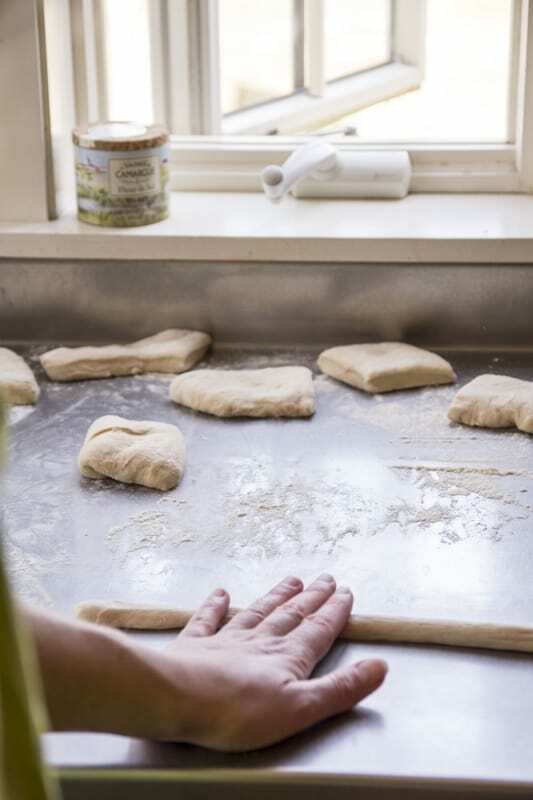 Preheat oven to 425 degrees F.
Meanwhile, turn-out dough onto a lightly floured surface, and flatten and cut into 8 equal pieces, about 3 ½ ounces each. See photos for snake technique. 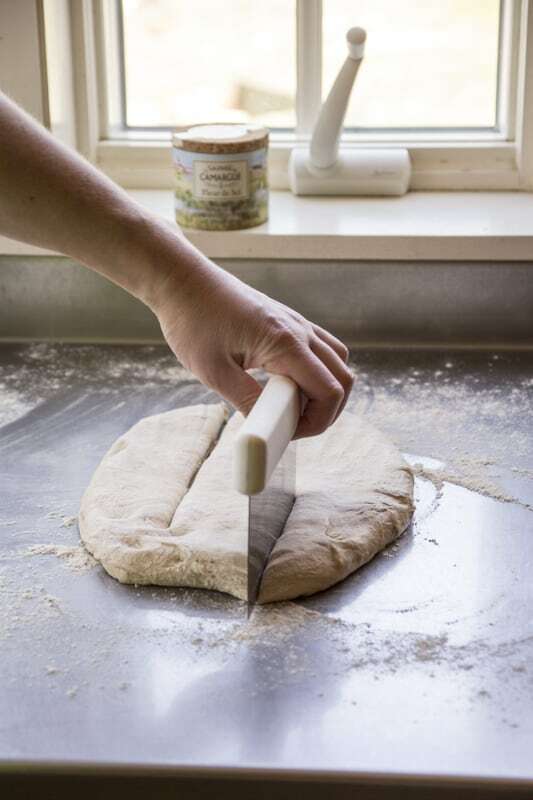 Roll each dough into long even ropes, about 22-inches long. 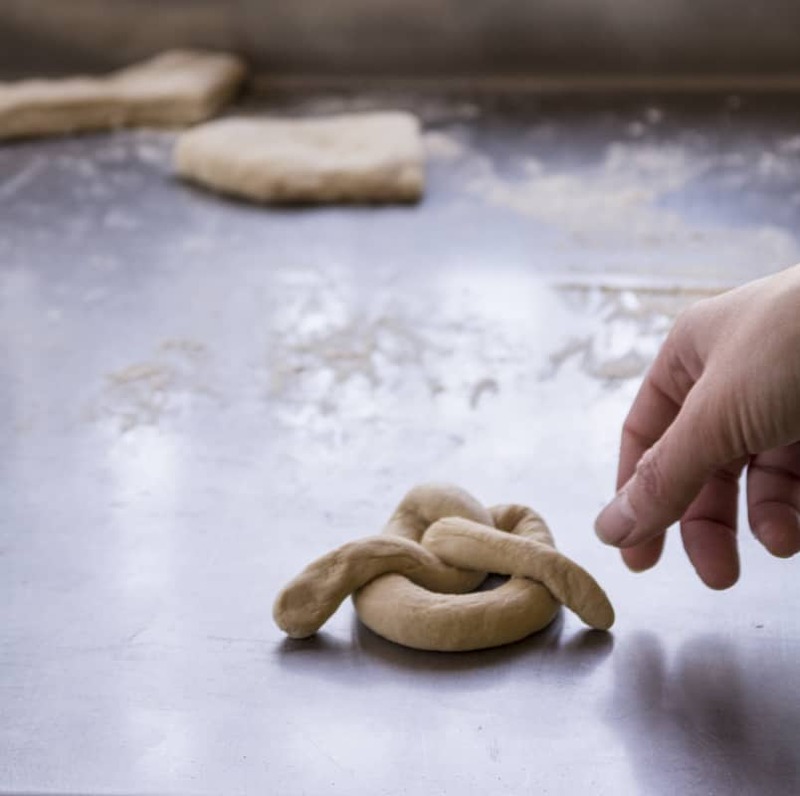 Shape into pretzel by forming a loop at the bottom and then twisting the top over one time. Wrap the tails down to the opposite bottom side and press them down to adhere. 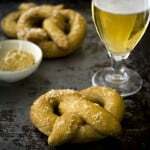 Transfer four pretzels to the boiling baking soda bath and allow to blanch until they are puffed up, 1 to 2 minutes. Transfer the pretzels to a clean dish towel to drain off the excess moisture before transferring them to the prepared baking sheet. Repeat with the second batch, making sure that the water comes to a boil again before adding them to the bath. Top Pretzels: Brush all of the pretzels with the egg using a pastry brush. Sprinkle the coarse salt and seeds over the pretzels. Bake until dark golden and the exterior is set up, 12 to 14 minutes. You *have* been using up some white whole wheat flour. Love that stuff! These look amazing. Yummy! Was your reunion fun? Who came that I would remember? Debbie, The reunion was so much fun. It went by really fast, and I wish I could see everyone more often. Amanda and Christina were there. George School was more beautiful than ever. They are making a lot of really nice changes to the buildings on campus. Have you been back there or to NFS to visit lately? 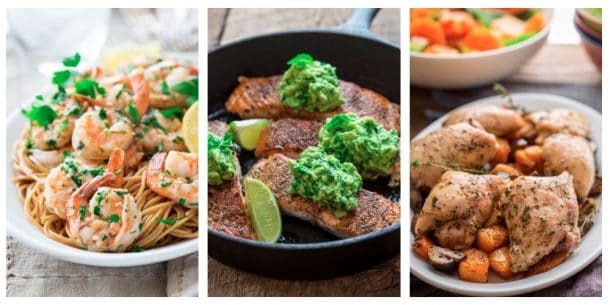 Hi…these look great and I love how much thought went into the recipe! Just wondering, could I use regular active dry yeast in place of the instant yeast? Thanks! Yes, you’ll just want to dissolve it in the water before adding the flour in step one. Please let me know how they come out!